Clarinettist Joanna Nicholson graduated from the Royal College of Music, where she was the winner of an Exhibition Scholarship and numerous prizes. She pursueS a lively freelance career performing, broadcasting and recording with many of the UK’s finest orchestras and ensembles, and featuring as a soloist – notably on Bass Clarinet with the BBC Scottish Symphony Orchestra at the London Proms, and with the Scottish Ensemble, performing the Finzi Clarinet Concerto. She has performed chamber music in venues including the Purcell Room and New York’s Lincoln Center, and regularly works with jazz and folk musicians in cross-over ensembles. In the last six months her work has included writing and performing a musical story with live electronics, “The Starlicht Runaway” for children aged 3-6 and their families, performing as soloist in Weber’s 2nd Clarinet Concerto, orchestral playing with the BBC Scottish Symphony Orchestra and Scottish Chamber Orchestra, and contemporary chamber music with Red Note Ensemble and Turning the Elements, a new commission with singer Frances Cooper of poetry and music by Scottish writers. Emma Lloyd is a violinist and violist specialising in the performance of experimental contemporary music and improvisation. She performs as a soloist and in small ensembles, working often with live electronics, and collaborating regularly with composers. In addition to the modern set-up, she plays a baroque violin and performs both baroque and contemporary music written specifically for this instrument. As an improviser, Emma’s performance tends to be quiet and intimate in nature, exploring the innate timbral qualities of the violin, and discovering some of the often hidden sounds that can be found with her unique combination of technique and tools. 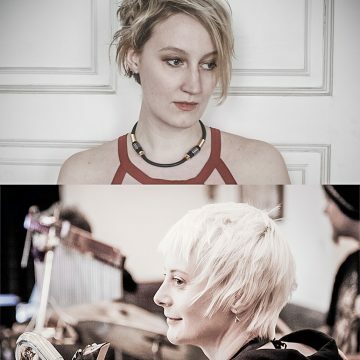 Ensembles include KUBOV, a violin/electronic duo with Jess Aslan, and a duo with pianist Karin Schistek. She is the violist with the Ison trio and she plays in improvisation groups Grey Area and Edimpro.